Dermatochalasis is a term used to describe the presence of loose and redundant eyelid skin. It is a common sign of periocular aging and is often seen in middle-aged and elderly people. More dramatically seen in the upper eyelids, dermatochalasis can affect lower eyelids as well. It is commonly associated with orbital fat herniation, known as steatoblepharon, and drooping of the eyelids, known as blepharoptosis. Additionally, an indistinct, low or double eyelid crease may be noted. Periocular aging from intrinsic and extrinsic factors is a common cause. Aging leads to weakening of the connective tissue and loss of skin elasticity. In addition, the skin is weighed down by the effect of gravity. The interplay of these factors leads to classic hooding of the upper lids. Weakening of the orbital septum and herniation of the orbital fat adds to the bulging appearance. Trauma, systemic disease like connective tissue disorders or thyroid eye disease, idiopathic inflammation of the eyelids known as blepharochalasis, or previous surgery can potentiate these changes. Prior trauma or facial surgery, local nerve palsies, and more rare connective tissue disorders or tumors may exaggerate this condition. Patients with dermatochalasis of the upper eyelids may report decreased peripheral vision from the interference of the drooping tissues classically known as lateral hooding. Others may complain about a heavy or tired feeling around the eyes, a dull brow ache, or interference in the central vision due to droopy lids or lashes obscuring vision. Occasionally they may describe a shadow in the upper or side vision, or skin dermatitis due to moisture within the redundant skin folds. Dermatochalasis also is a cosmetic concern, as it gives a tired and dull look to the face. Lower lid dermatochalasis is mainly a cosmetic issue but in few patients may lead to dermatitis secondary to sweat collection in the acquired folds or difficulty wearing glasses. A thorough eye examination by an ophthalmologist is necessary to rule out diseases of the eye itself that may limit ameliorative options for patients bothered by dermatochalasis. Furthermore, a detailed examination to look for anatomical changes or pathology helps to formulate the appropriate management plan. Special attention to brow position and brow contour is important to differentiate between true and pseudo dermatochalasis. Measurement of redundant eyelid skin, levator excursion, prolapsed orbital fat, presence or absence of blepharoptosis is needed to quantify the type and degree of dermatochalasis. Additionally, evaluation of the presence of eyelid retraction, amount of eyelid laxity, and changes in the surrounding bony framework and periocular tissues is necessary . Functional disability by dermatochalasis is documented by external photography and visual field testing with and without eyelid taping or elevation. Upper eyelid blepharoplasty to correct dermatochalasis is one of the most frequently performed procedures by the ophthalmic plastic surgeon, whether for cosmetic or functional purposes. The procedure is performed by first outlining the tissue to be excised, beginning at the upper eyelid crease. Care should be taken to ensure enough skin remains for adequate eyelid closure. Oftentimes, portions of the preseptal orbicularis will be removed with the skin. If there is significant steatoblepharon, or fat herniation, the orbital septum may be opened and preaponeurotic fat trimmed or debulked, creating a more even upper eyelid contour. Fat removal should be done conservatively, to avoid a resulting hollowed appearance. Incisions are generally well hidden within the upper eyelid crease, and sutures are used to approximate skin edges. 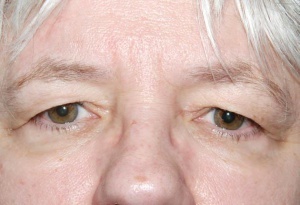 Lower eyelid blepharoplasty may be performed for fat herniation and excess tissue of the lower eyelids. This is generally considered a cosmetic procedure and reduces the appearance of "bags" under the eyes. Midface of face lifting can augment the result of lower lid blepharoplasty surgery. Additional wrinkle reduction may be achieved by laser resurfacing or chemical peels. Brow lift or brow pexy to correct the associated brow ptosis are often performed along with blepharoplasty. Risks of surgery include bleeding, bruising, scarring, asymmetry, need for additional procedures and retrobulbar hemorrhage. Blepharoplasty is generally well-tolerated with oral analgesia and cold compresses in the early post-operative period. Some ophthalmic plastic surgeons add peri-operative intravenous and post-operative oral and/or topical antibiotics to minimize the already small risk of infection. Bruising can be expected for 1-2 weeks after surgery, and swelling is most noticeable for the first several weeks. Depending on the suture used for skin closure, sutures are removed at the discretion of the surgeon usually within 1-2 weeks after surgery. External photographs are typically taken to document postoperative changes and healing process. Complete healing of the scar and tissue swelling can take several months or more. American Academy of Ophthalmology. Oculoplastics/Orbit: Dermatochalasis Practicing Ophthalmologists Learning System, 2017 - 2019 San Francisco: American Academy of Ophthalmology, 2017. ↑ Jacobs, L.C., et al., Intrinsic and extrinsic risk factors for sagging eyelids. JAMA Dermatol, 2014. 150(8): p. 836-43. Techniques in Ophthalmic Plastic Surgery with DVD: A Personal Tutorial. Jeffrey A. Nerad MD. Saunders 2010. Orbit, Eyelids, and Lacrimal System. BCSC Section 7. American Academy of Ophthalmology. 2008. This page was last modified on January 16, 2019, at 11:10.